Fru-Gal.org: Snapfish: 100 prints for 88 cents shipped! 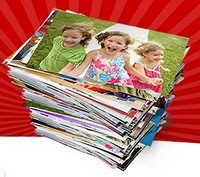 Snapfish: 100 prints for 88 cents shipped! This is a sweet deal on 4x6 prints if you need to order some from your summer happenings! Right now, order (100) 4x6 prints and use code WEDPRINT at checkout to pay only a $1 plus tax. Shipping is included! Plus, get 12% cash back through Shop at Home, making your prints only 88 cents shipped!